Last spring, Cristian Dallapozza and Tommaso Cardelli saddled up their bikes with black crows equipment to take Heini Holtzer’s tracks, a great, steep slope forerunner in the 1970s. A visionary of the possibilities of descents in the mountains, Holtzer is without doubt the first climber-skier to have allied mountaineering and steep slopes, opening routes for other legendary skiers like Patrick Vallençant and Anselme Baud. Both originating from the Dolomites, Cristian and Tommaso imagined this wander across three alpine countries to repeat some of their famous compatriot’s great realisations. They shot a film, Finding Holtzer, under the baton of their friend, Federico Modina, the welcome for which, by the Annecy public, at the last High Five festival, has convinced them to continue filming their adventures. Here is a short interview with both protagonists, while waiting to air the film in its entirety. black crows: how did this idea to take Holzer’s tracks came to mind ? Cristian: Holzer is known here in the Dolomites, thanks to the many first descents he made around here and in the Alps in general. 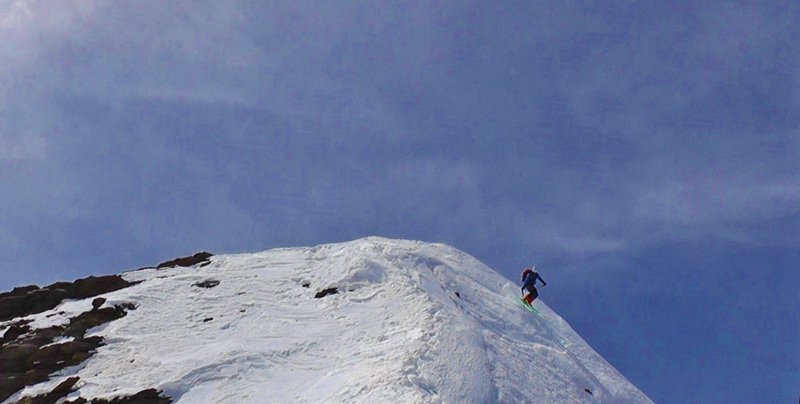 We have always been fascinated by him and we both love steep skiing, so the idea came spontaneously. black crows: How difficult did these descents seem 40 years later? Tommaso: The descents are not easy at all, there are some really steep ones, but the lines are spectacular. 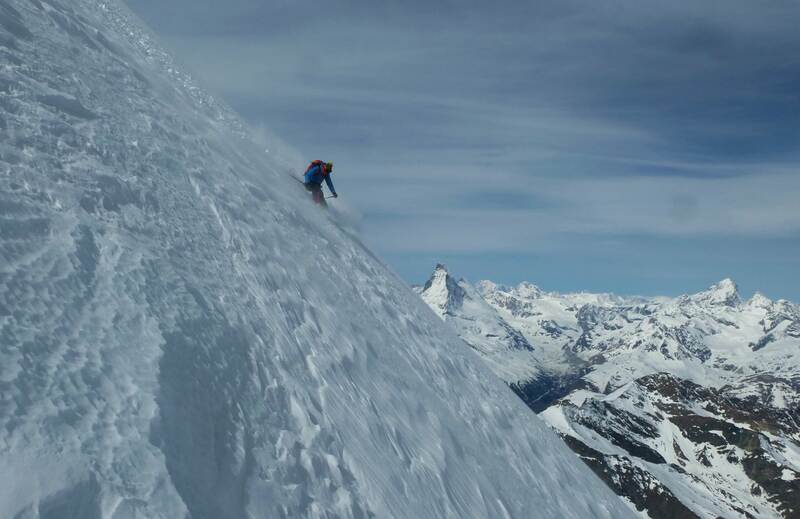 It is impressive to imagine Holzer doing these descents more than 40 years ago, with the material he owned. It is also impressive to see how the glacier changed and by consequence the descents; some lines are almost impossible to do now because there isn’t enough snow-ice or the seracs are too big and dangerous. black crows: How great is Holzer’s fame in your part of the Alps ? In France, Sylvain Saudan is better known, Holtzer is surrounded by mystery. Cristian: Here in the Dolomites, he is known, but not famous because he wasn’t a character who looked for glory, however he has done so much around here, that he can easily be considered the precursor of the steep skiing in this area. Most of his activity was at the beginning the ‘70s, more or less, at the same period as Saudan. Holzer made his descents mostly in the Alps, Saudan is also very famous for his beyond-Europe activity. black crows: Did the idea of doing a movie came naturally ? Tommaso: Before leaving for the journey, we decided to shoot some of our descents in order to produce a little video clip. Usually we don’t film much, we prefer skiing! Making a movie was a great experiment, we learned a lot of things and we are sure that the next movie will be better than this one. black crows: Why did you choose to go by bike and not use an SUV with full power engine? 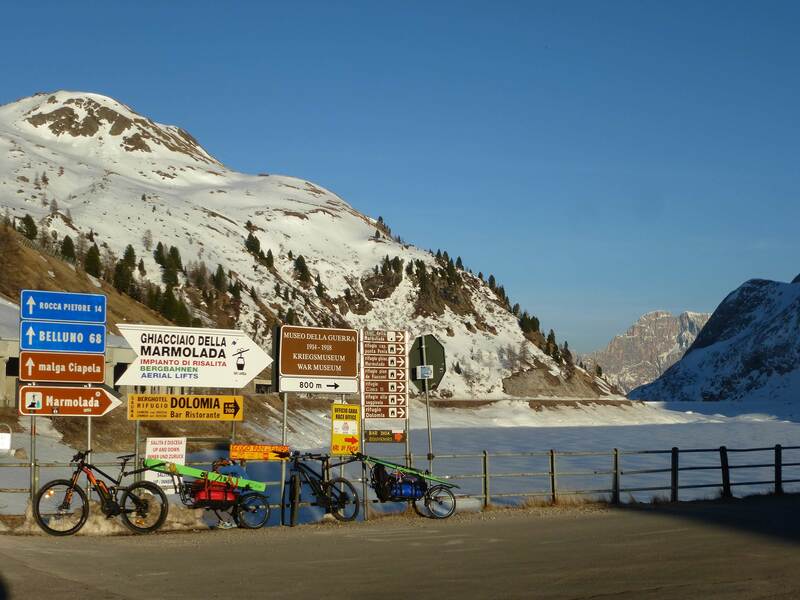 Tommaso: We chose the bikes, because we wanted to have a different experience. With slower rhythms you have the chance to look further and experience the trip more intensely. Our goal wasn’t only the skiing part but all the tour, so transfers by bike, approach and ski descents; all this it was a good adventure! black crows: Could you go everywhere by bike or did you have to jump into transport sometimes? Cristian: The bikes and trailers were perfect, we rode pretty much everywhere: main roads, single tracks, bike paths etc. We only once jumped onto a train, the famous red-Swiss-train, to cross a pass that was still closed due to snow. It was also good to rest a bit! black crows: How did the skiing go? Could you do everything you wanted? Cristian: Weather and snow conditions weren’t always perfect, so sometimes we had to come back without having achieved the end goal. The first week was almost perfect and we were able to do all the descents that we had planned, but during the second part of the trip we had a lot of rain and hot temperatures, so we changed our programme day to day. However considering the time we had, I am satisfied by what we managed to do. black crows: How do you know each other? Cristian: We met during mountain guiding courses, we became friends and started skiing and climbing together. “White Spirit”, our association, consists of 3 people (Tommy, Cristian and Maurizio); we are primarily a group of friends who like skiing/snowboarding and travelling, and with this excuse we organise ski-trips all over the place with clients. 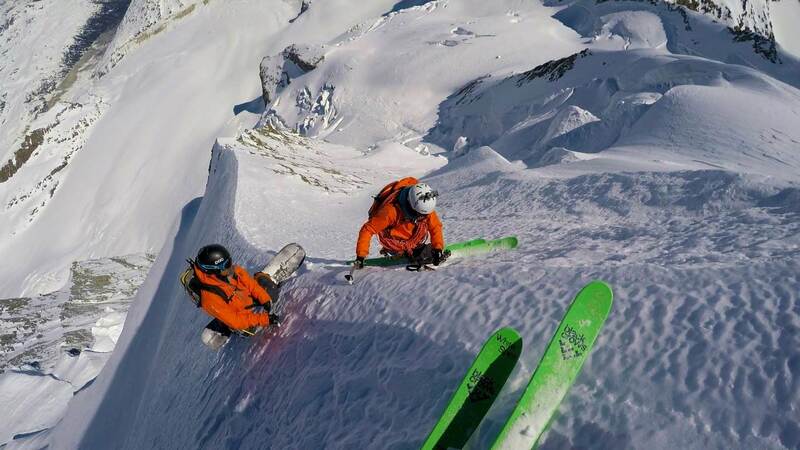 black crows: What is your relation to steep skiing, do your consider yourselves as steep hunters ? 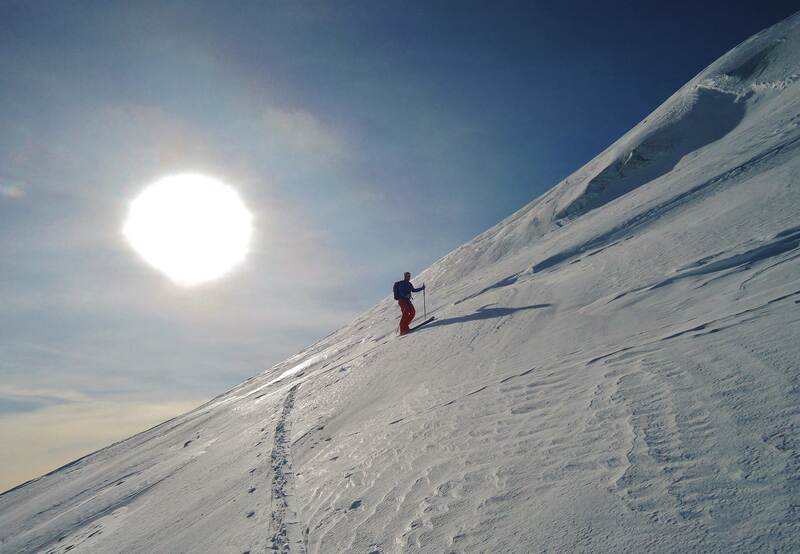 Cristian: When there are good conditions, I enjoy skiing on steep slopes, but I wouldn’t consider myself a “steep hunter”. Tommaso: I’m a ski lover. I like skiing every snow condition and every kind of slope. Of course doing something challenging, with a technical uphill and steep downhill, is something that has always attracted me. black crows: How did you become crows and for which models have you preference ? Cristian: Every year we organise a ski-test event, a couple of years ago we also invited the Black Crows. We had the chance to meet Bruno and Simone and the collaboration started there. I mostly ski with Corvus, but for this project they were definitely too heavy, so I chose the Navis: the perfect compromise between weight and skiing. Of course I am satisfied with the skis, I could’t ask for any better! Tommaso: Black Crows is like a little family, since I first met Bruno and Simone, and during this year I was able to ski with a lot of crows, it’s nice! During last winter I mostly skied with Atris in powder days and Navis Freebird for mountaineering. At the end of last winter I tried the new Corvus Freebird and I’m ready to wear pink next winter! black crows: What comes to mind when you think of this adventure ? Cristian: When I recall this adventure, the first thought I have is that I would leave again tomorrow!